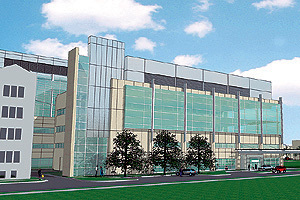 The new Comer Center for Children and Specialty Care (shown above in an architect’s rendering), will adjoin the Comer Children’s Hospital at the University of Chicago. Both the hospital, which opened in February 2005, and the new facility are two steps toward the University’s future goal of developing the best children’s hospital for the care of complex disease. The $42 million gift for the new center from Lands’ End founder Gary Comer, and his wife, Frances, follows two previous donations of $21 million given in 2001 to build the Comer Children’s Hospital and a $20 million donation in 2003 to fund a pediatric emergency room for the hospital. Gary Comer, founder of the Lands’ End clothing-catalog company, and his wife, Frances, have made a $42-million donation to the University to create the Comer Center for Children and Specialty Care and to recruit leading physician-scientists and build programs providing state-of-the-art care. The gift is the largest single donation ever made to the University and raises total support from the Comers for children’s services here to more than $84 million. That total includes a $21 million donation in 2001 to build the seven-story University of Chicago Comer Children’s Hospital, which opened in February 2005. The Comers also made a $20 million gift in 2003 to add a pediatric emergency room to the children’s hospital and to support other programs. In March 2005, construction began on the Comer Center for Children and Specialty Care, which will adjoin the children’s hospital. Although the exact configuration may change, current plans for the center would include doubling the operating room and procedural capacity, concentrating pediatric specialty ambulatory care within Comer, and adding 20 to 25 beds to the current 155. The new pediatric emergency room will be substantially larger than the current children’s ER, and it also will include enhanced waiting and family areas as well as new teaching space. Total cost of the project, not including faculty recruitment and program development, is $100 million. “We are tremendously grateful for the extraordinary commitment that Gary and Frances Comer have made to the well-being of children, not just to those on the South Side of Chicago but also to children from all around the world,” said President Randel. Michael Riordan, President and CEO of the University Hospitals, said, “The Comers’ remarkably generous gift, which follows a series of equally remarkable gifts, guarantees that the University will remain at the forefront of children’s medicine, providing the best possible setting for superb patient care, research and training. It also means that Comer Children’s Hospital, and the doctors and staff working here, will play a growing role in improving health care for all children,” said Riordan. Comer Children’s Hospital already has become a national model for pediatric health care, with nationally recognized programs in cardiology, cancer, neurology, neonatology, minimally invasive surgery, gastroenterology, transplantation and other pediatric medical and surgical specialties. Developing the specialty care center is the University and the Hospitals’ next step in a commitment to children’s health care. In November 2005, the University broke ground for the Center for Biomedical Discovery. Nearly one-third of this facility will be devoted to the Institute for Molecular Pediatric Science, which will house up to 50 research teams. Physician-scientists in the institute, known on campus as IMPS, will “explore childhood diseases at the most basic level,” Goldstein said. “It will harness the insights of the biomedical revolution and apply them to the care of sick children.” The Comer Center for Children and Specialty Care, by focusing on complex disease, will help the most needy children right away, but “the clinical and basic science faculty will apply the insights gained from complicated cases to open a window on the fundamental processes of all childhood diseases,” he said. Gary Comer, 78, was born and raised on the South Side of Chicago and graduated from the Paul Revere School on 72nd Street in 1942. Having been an avid sailor and an advertising copywriter, Comer combined his talents in 1962 to start a mail-order business, distributing sailing gear, rain suits and sweaters. By the spring of 1963, Comer and five partners incorporated Lands’ End Yacht Stores. After years of growth and a move of the business operations to Wisconsin, the company went public in 1986. Lands’ End is now the second largest apparel-only mail-order business with the world’s largest clothing Web site. Comer stepped down as president in 1990, but remained chairman of the board and the majority stockholder. In 2002, Sears purchased Lands’ End. The Comers have given about $50 million to the Revere School community, including a $30 million donation to create the Gary Comer Youth Center, an activity, performance and education center for area youth adjacent to his alma mater; $7 million to the Revere School, where he has funded a series of educational initiatives; $5 million to a neighborhood housing initiative; and about $1.5 million to the South Shore Drill Team. At the University Hospitals, the Comers also have supported research on an innovative approach to ovarian cancer and launched the Comer Pediatric Mobile Care program, run by University physicians. The mobile care program brings comprehensive primary and preventive health care to students at South Side public schools.